Darren Campbell and Todd Bennett invite you to take part in the Team Superschools Challenge. They have set TSS the challenge of visiting 2012 schools by 27th July 2012, which is the date of the Opening Ceremony for the London Olympics. A team of Olympians has been recruited to join them in their quest, including GB team captain Christian Malcolm, GB Long Jump Record Holder Chris Tomlinson and multi Commonwealth Gold medalist gymnast Luke Folwell. Schools will receive a visit and motivational talk from a sporting celebrity. All the children will have their photograph taken with the celebrity and take part in a fun fitness training session. 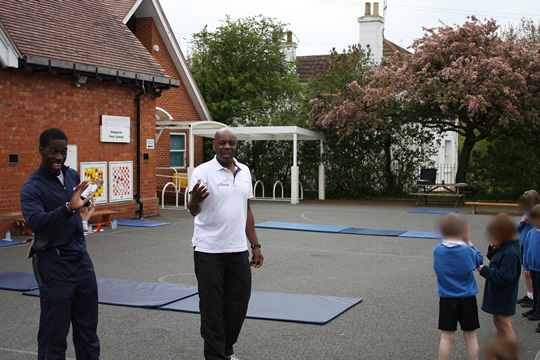 Click here to find out more about Team Superschools. Les and Christian Malcolm doing some serious preparation before a talk!